Growing up I didn't eat fish, at all (well, I ate calamari, but only because I was tricked and bamboozled and couldn't back down after I scarfed a whole plate of fried delight.) A few years later, going out for sushi became really hip and I had to tackle my issues or compromise my cool. Obviously, I embraced the hip. THEN we moved to the Pacific Northwest. Land of drizzle, coffee and salmon. Again, I was faced with either losing out on every chef's special, or... OH WAIT, this stuff is delicious and I a fan! From plank cooked to a special combo of salmon stuffed with brie, crab and shrimp, I'm a fan. Here's a great recipe we found doing some googling a few days ago. Preheat the oven to 425. In a small bowl, mix the mustard, butter and honey. Stir until ingredients are fully incorporated. In another small mix bread crumbs, pecans and parsley. 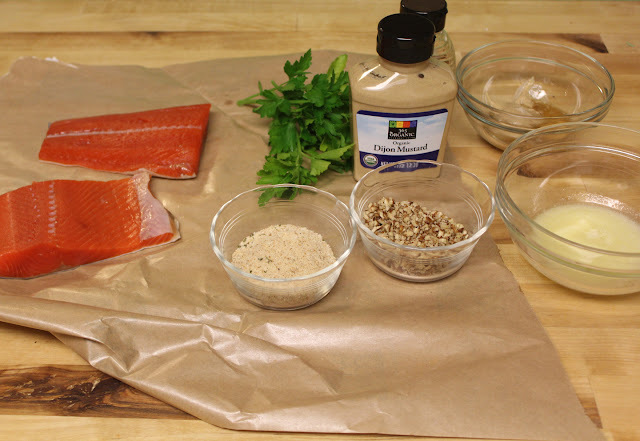 Place salmon filets on a parchment lined baking sheet and brush with butter, honey and mustard mixture. Cover the fish with the bread crumbs, pecans and parsley mixture. Press the nuts and bread crumbs lightly into the fish to fix them into place. Bake for 10 minutes or until the thickest part of the fish is to the doneness you prefer. Serve with lemon and salt and pepper. 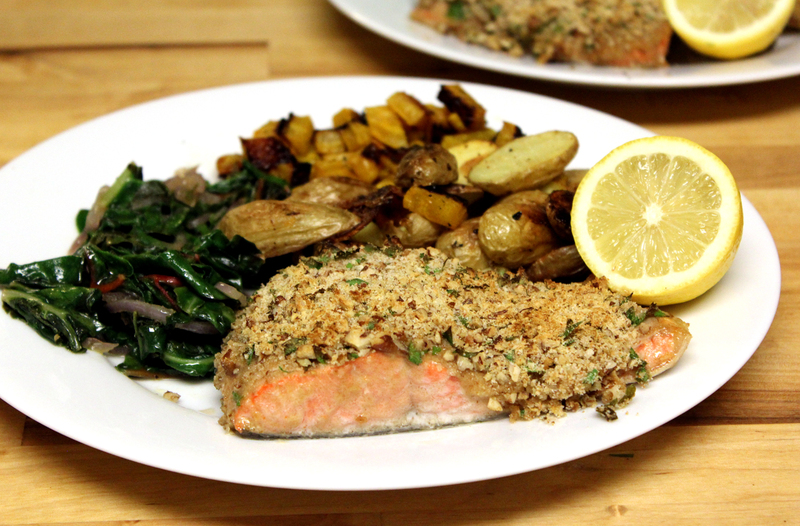 This was delicious and SO easy/fast/weeknight-friendly. Despite the ingredients, it is definitely NOT a honey-mustard flavor. It's light and sort of tangy-sweet, but not like a salad dressing. I will change the pecan/bread crumb ratio next time and add more pecans and less bread crumbs. I will add a bit of parmesan to the bread crumb combo the next time we make this. Why? Because parm is good. The End. 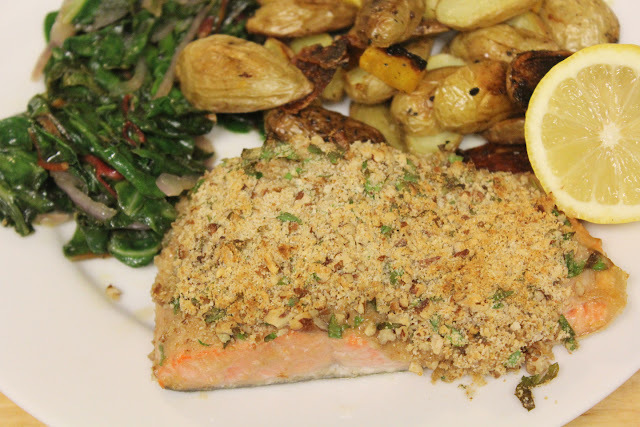 We served this with a combo of roasted potatoes and beets and a saute of swiss chard, onions and garlic. We were totally proud of our antioxidant-rich, colorful, superfood meal. Enjoy!